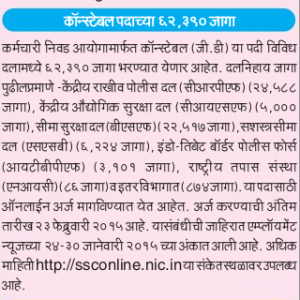 Staff Selection Commission invites online application for various posts. Staff Selection Commission invites online application for various posts, from eligible candidates. Candidates can submit their application before 23 February 2015 this last date. Regarding post, advertisement please visit to http://ssconline.nic.in for more Information about Government job then, please visit time by time to www.abdulsattar.in this website.